*To watch the film (w/ subtitles), click here. Consider all of the following. 1. Consider the significance of father’s message about mercy & its relation to the rest of the film. 2. Consider the significance of Zushio’s corruption, transformation, and rejuvenation. 3. Consider the use of flashbacks in the first half of film. 4. Consider the representations of the mother and father. 5. Consider the mood throughout the film, and its numerous changes. 6. Consider the notion of human nature presented in the film. How is human evil presented? 7. Consider the most affecting/beautiful scenes. 8. 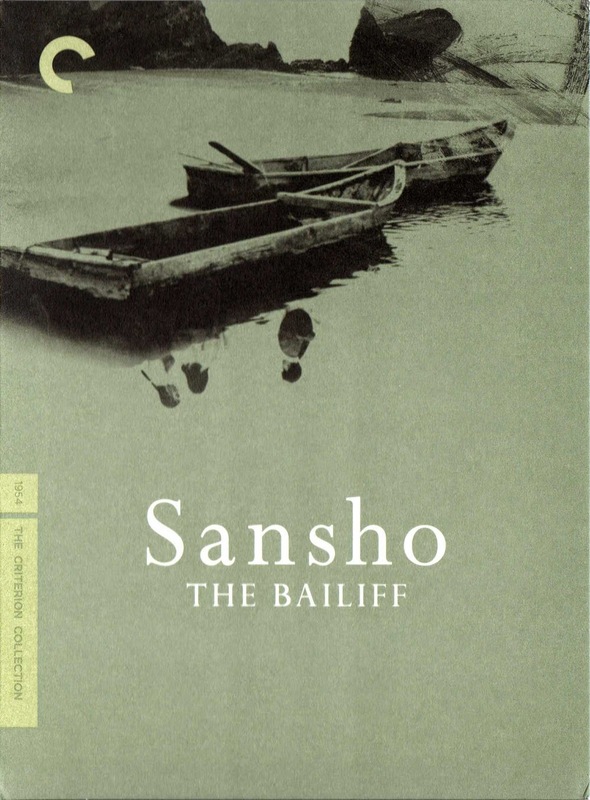 Consider what happens in the end (with Sanshō and his slave factory). Are scores settled? Is revenge exacted? Is there resolution? 10. Consider the representation of Anju. 11. Consider what liberal or left-leaning ideas or ideologies inform the film. How do these relate to the historical context of postwar Japan? 12. Consider how the Mother’s song functions as a kind of recurring motif. What does the musical score add to the film? 13. 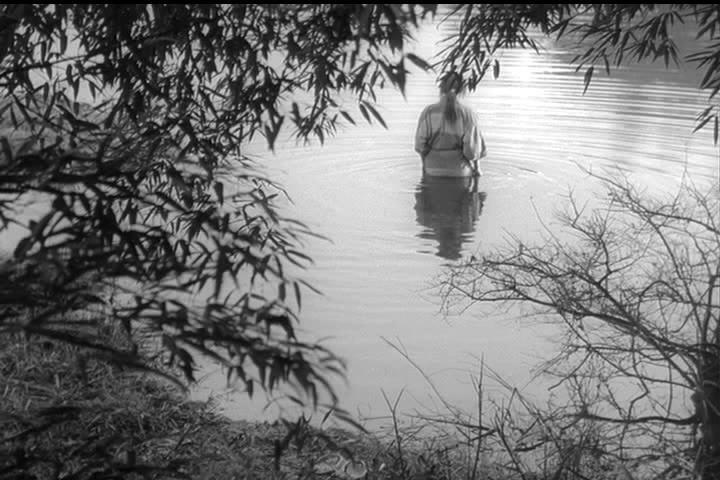 Consider why Mizoguchi chooses to reverse the ages of the two children. 14. Consider the acting. Is this realistic/mimetic method acting, or is it more formal & stylized? 15. Consider the religious elements in the film. 1. Apollonian and Dionysian: Apollonian and Dionysian are terms used by Nietzsche in The Birth of Tragedy to designate the two central principles in Greek culture. The Apollonian, which corresponds to Schopenhauer’s principium individuationis (“principle of individuation”), is the basis of all analytic distinctions. Everything that is part of the unique individuality of man or thing is Apollonian in character; all types of form or structure are Apollonian, since form serves to define or individualize that which is formed; thus, sculpture is the most Apollonian of the arts, since it relies entirely on form for its effect. Rational thought is also Apollonian since it is structured and makes distinctions. 3. Echigo (Niigata): Nihonkaigawa; where the town of Kasuga is. 4. Sado 佐渡国 (tiny island in Nihonkai; part of Niigata, Sado City): place of exile. The Tango-bound boat passes through the following looking for buyers . . .
2. Noto 能登国 (Ishikawa-ken): the tip prefecture; on Nihonkaigawa. 7. Taira (or Heike) Clan: One of 4 important clans of Heian (others were Minamoto, Tachibana, Fujiwara); arrogant; destroyed in Genpei War (1180-1185); subject of Heike monogatari. 1. Give a concise summary of the story. 2. Despite taking place in the Heian period, the story is very much about the contemporary world in which Ōgai lived. Identify the major themes of the work and explain how they reflect/relate to/engage with the historical period? Is the story an allegory for Japan in 1915? If so, what corresponds to what? 3. Discuss the work’s fantasy-like ending, in which all conflicts are suddenly and almost miraculously resolved. Why do you think Ōgai made these alterations to the original story? What is the effect of such changes? Does this unexpected happy ending prove that Ōgai was ultimately a conservative/reactionary writer who was paranoid about social unrest and revolution? 4. Compare Ōgai’s story to Mizoguchi’s film that was made a few years after the end of WWII? How are they each a reflection of their times? How do they represent different ends of the ideological spectrum? 5. Discuss the narrative voice. Who is narrating? Is the narrator omniscient? Does it employ mostly showing or telling? Does it focalize itself in any of the characters? Does it relate events that are mostly constitutive or supplementary? What style is it written in (言文一致 or 雅俗一致)? 6. After General Nogi’s famous seppuku suicide in 1912 following the death of Emperor Meiji, Ōgai became rather obsessed with the ideas of junshi (殉死) and self-sacrifice. Discuss the theme of self-sacrifice as it is presented in this work, represented most conspicuously in the two characters, Ubatake and Anju. 7. What does Ōgai believe to be the proper relationship between history and fiction? What is his attitude toward his historical materials? 8. Ōgai describes his own artistic temperament as more “Apollonian” than “Dionysian.” What does this mean? What is Apollonian or Dionysian about “Sanshō the Steward”? 9. How is human nature presented in the work? What is Ōgai trying to say about human nature, the various kinds of evil, etc.? 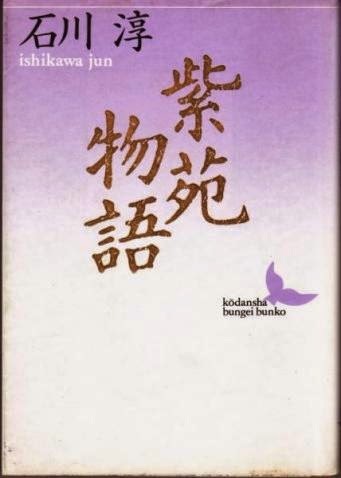 Yakeato generation (yakeato sedai 焼跡世代): “The boy in this short story belonged to a generation of war-orphans numbering approximately 123,000 by the end of the war in 1945. The child literally defies description because the ‘taxonomy of his kind had yet to be invented.’ The taxonomy that Ishikawa was looking for in 1946 when the short-narrative was composed was shortly to define an entire generation that would come to be known as yakeato sedai or the ‘generation coming of age amidst the burned-out ruins after the war.’ Ishikawa was born in 1899 and set a literary precedent when he used the title phrase to signify an orphaned child growing up in the burned-out ruins of metropolitans where the immediate black-market economy signified the struggle for daily survival. Ishikawa’s indistinguishable usage of the term yakeato introduces the possibility of a generation that would rise like a phoenix out of the ashes of the long war” (Rosenbaum, 2006, 2; for more, see Legacies of the Asia-Pacific War: The Yakeato Generation, edited by Roman Rosenbaum, Yasuko Claremont (2012), as well as Rosenbaum’s article “Ishikawa Jun and Postwar Japan”). Yatsushi やつし: From the verb yatsusu which means “to disguise,” yatsushi is a disguised contemporary version of a romantic figure from antiquity or classical literature. It involves the inversion of something refined/noble into something vulgar/plebeian. In this story, the yakeato orphan is described as a sort of yatsushi version of Jesus Christ. Ishikawa Jun discusses this term—along with mitate, haikai, honkadori, and other terms related to Edo-period aesthetics—in his essay “On the ThoughtPatterns of the People of Edo” (1943). Mitate 身立て: Analog; the depiction of one thing through the presentation of something else. In traditional waka, it is associated with a kind of “elegant confusion,” such as when falling cherry blossoms petals are mistaken for snow. In general, the term means “selection” and signifies imagery that combines two completely different subjects, often drawn from high culture and popular culture respectively. In this story, the yakeato orphan is given an added depth through his mitate link through with Jesus. Kiyomizu hall 清水観音堂: Inspired by the magnificent Kiyomizu-dera in Kyoto, Ueno Kiyomizu Kannon-dō was established by Abbot Tenkai Sōjō, who was also the founder of the Kan’eiji Temple. Built in 1631, the temple is one of Tokyo’s oldest, and has miraculously survived battles of civil war and bombing raids. Today, it is recognized as a national treasure. Tōshōgū Shrine東照宮: Built in 1616, the shrine is one of numerous shrines in Japan dedicated to Tokugawa Ieyasu, the founder of the Edo Shogunate. Until 1868, the shrine was a part of Kan’eiji Temple. Ueno black market (yamiichi 闇市): A major site of the black markets that flourished in the immediate postwar period, when goods were hard to come by. Dazai Shundai 太宰春台 (1680-1747): Neo-Confucian scholar, born in the province of Shinano (Nagano prefecture). Entering the service of the daimyo of Izushi near Hyōgo, he studied under Nakano Iken. Later, having left the Izushi estate, he became a disciple of Ogyū Sorai. He then entered the service of the daimyo of Ooimi (Shimōsa) but soon decided to teach. His favorite subject was economics, and he published a number of works on the subject, the best known of which were Keizairoku (Discussion of Economics, 1729) and Keizairokushū-i (Discussion of Economics, part two). He wrote more than 50 works. (Louis Frédéric, Japan Encyclopedia, 150). Hattori Nankaku 服部南郭 (1683-1759): Confucian scholar, painter, and poet of the mid-Tokugawa period. Born in Kyoto, he studied the Chinese classics under Ogyū Sorai, then opened his own school in 1716. He is best known for his Bunjinga “scholarly paintings,” which are in imitation of the Chinese Qing-dynasty style. He helped to popularize Tang poetry, which had an enormous influence on Edo culture. Gap (béance) (Term in Lacanian Psychoanalysis): The French term béance is an antiquated literary term which means a ‘large hole or opening.’ It is also a scientific term used in medicine to denote the opening of the larynx. The term is used in several ways in Lacan’s work. In 1946, he speaks of an ‘interrogative gap’ which opens up in madness, when the subject is perplexed by the phenomena which he experiences (hallucinations, etc.) (Ec, 165–6). In the early 1950s, the term comes to refer to the fundamental rupture between man and NATURE, which is due to the fact that ‘in man, the imaginary relation has deviated, in so far as that is where the gap is produced whereby death makes itself felt’ (S2, 210). This gap between man and nature is evident in the mirror stage [...] The function of the imaginary is precisely to fill this gap, thus covering over the subject’s division and presenting an imaginary sense of unity and wholeness. In 1957 the term is used in the context of the relationship between the sexes; ‘in the relation between man and woman…a gap always remains open’ (S4, 374; see S4, 408). This anticipates Lacan’s later remarks on the non-existence of the SEXUAL RELATIONSHIP. In 1964, Lacan argues that ‘the relation of the subject to the Other is entirely produced in a process of gap’ (S11, 206), and states that the subject is constituted by a gap, since the subject is essentially divided (see SPLIT). He also argues that the concept of causality is essentially problematic because there is always a mysterious, inexplicable gap between cause and effect (S11, 21–2). 1. Describe the narrative structure of the work. Who is narrating the story? What it his relation to the world he is describing? 2. Describe the scene at the Ueno yamiichi (black market). What phase of human history do we seem to be in? What is the relation between past, present, and future? Does the narrator feel that the world has really turned over a “new leaf”? 3. Describe the woman selling the o-musubi rice balls. How does the narrator react to her? What qualities does she seem to embody? 4. Describe the yakeato orphan who appears in the black market. How do people react to him? How does the narrator react? What powers does he seem to possess? 5. Describe the incident that takes place in the market. How does the narrator become involved? 6. What does the narrator intend to do when he gets to Yanaka? What is the significance of this act? Explain his interest in Dazai Shundai, Hattori Nankaku, Edo period (particularly Tenmei era), Tang dynasty, etc. 7. Describe the appearance of the orphan the next day. Why does he chase down and attack the narrator? What does this scuffle symbolize? 8. 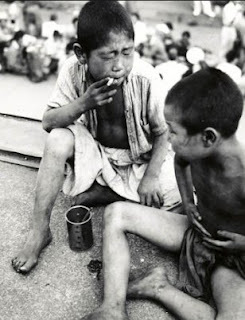 Discuss the connection between the yakeato orphan and Jesus Christ in terms of the Edo/Ishikawan concepts of yatsushi and mitate (see definition above). Until only yesterday stands had lined the alleys of the marketplace like a wall. But what about today? All that remained along either side of the streets were the long, empty rows of stalls constructed of flimsy reed screens. Stretching as far as the eye could see, they resembled huge stable equipped with countless berths and mangers. But it was a horseless livery. Not a horse was in sight. Peering still farther inside, one saw an open space. It looked freshly swept. It was as if someone had taken a stiff broom and given it a vigorous sweeping. Still, the surface was market by a spot here and there. It was as though something had traipsed across it and left behind its traces. They were the marks of an unidentified being that had walked upon the face of the earth and left its telltale imprint. As a matter of fact, the traces looked ever so much like footsteps—yea, even hoofprints—that a strange creature, having wandered into the desert, left as its tracks in the sand. 10. Gaps, stains, openings, rips, tears, burn marks, traces, holes, etc. form a cluster of recurring images in the work. Discuss the significance of these images. Ishikawa Jun 石川淳 (1899-1987): Novelist from Tokyo. Made his literary debut in 1935 with the novella Kajin (The Nymphs). His 1936 novel Fugen (The Bodhisattva) won him the second Akutagawa Prize. After World War II, Ishikawa came to be regarded as one of the Shin-gesaku (new gesaku) school of writers. Other representative works are Yake-ato no Iesu (Jesus of the Ruins, 1946), Ōgon densetsu (The Legend of Gold, 1946), Taka (The Hawk, 1953), Shifukusennen (A Thousand Years of Happiness, 1966), and Kyōfūki (Account of the Wild Wind). 1. Ichioku sō-zange 一億総懺悔: “Collective repentance by 100 million.” “‘Ichioku,’ or one hundred million, refers to the size of the population of Japan, and by extension it becomes a metaphor for ‘all the subjects/citizens in the land’; ‘zange,’ or penitence, is done by all or in unison (sō)” (Tyler 1998, 274). The term was coined shortly after the war by Prime Minister Higashikuni Naruhiko, who called on the Japanese people to repent collectively for the war. His call has been criticized as an attempt to exonerate the militarists and the ruling classes who were directly responsible for the war, and to shift the blame to the entire population. Ishikawa indirectly addresses the themes of memory, amnesia, trauma, repentance, atrocity, etc in this story. 1. What genre(s) of novel might the work be classified as? Does the story fit into any of Todorov’s genres of “the uncanny,” “the fantastic,” or “the marvelous”? 2. Describe the narrative structure of the work. 3. Discuss the role of poetry in the work. What powers does poetry possess? How does Muneyori regard his own natural poetic gifts? Explain the connection between his renunciation of poetry and his rebellion against his father/his father’s courtly culture? 4. Explain the significance of the three arrows. What does each arrow represent? How are they related? What discovery does Muneyori make? 5. At its core, the work is an exploration of the problem of evil. Discuss the four types of evil that are represented in the work through the four characters of Tōnai, Princess Utsuro, Yumimaro, and Muneyori. Consider these characters in relation to Kant’s four types of evil mentioned above. Also, discuss the ambiguous relationship between diabolical evil (Muneyori) and ultimate good (Heita). 6. Describe the character Heita. Describe his doppelgänger-esque relationship to Muneyori. In what ways are they the uncanny mirror images of each another? What are their similarities? What are their differences? Do they complement each another to make a whole? 7. Describe the two settings—Muneyori’s province and the town beyond the mountain—and the inhabitants/communities/cultures of each. How does each group view the other? What is their relation to one another? 8. The work abounds in dichotomies/binary oppositions. Identify and describe them all. What does Ishikawa seem to be saying about the true nature of these dichotomies? 9. Explain the significance of the three plants: the asters (shion), the forget-me-nots (wasurenagusa), and the grasses-of-forgetfulness/day lilies (wasuregusa). Which plants does Muneyori plant? In what circumstances? For what purpose? Which plants does Heita plant? In what circumstances? For what purpose? How do these plants relate to the larger themes of the work, namely the problems of history, memory, trauma, atrocity, evil, etc.? 10. Describe the Buddhist statues that are carved into the rocks. Why is Muneyori driven to destroy them? 11. Discuss the character of Chigusa. 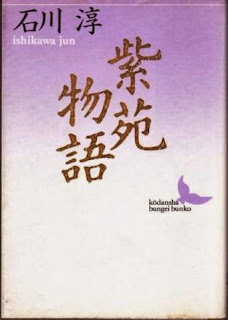 How does Chigusa and Muneyori’s relationship resemble that of Yang Kwei-fei 楊貴妃 and Emperor Hsuan Tsung 玄宗 from Bai Juyi’s Song of Everlasting Regret 長恨歌 (806)? 12. Given its main themes, can this work be read as an allegory of postwar Japanese society? Explain. 1. 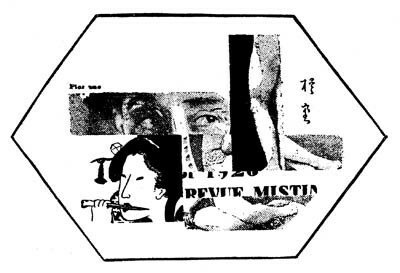 Shibusawa Tatsuhiko’s essay in Hen’ai teki sakka ron. Source: The Old Woman, the Wife and the Archer: Three Modern Japanese Short Novels. 1961. The Songs of Oak Mountain, by S. Fukasawa; Ohan, by C. Uno; Asters, by J. Ishikawa. Translated by Donald Keene. Answer in bullet-point form six of the following (including the required bonus question). Then discuss your answers with your group. 1. Discuss the scene at Awaji. Compare this scene to the Osaka puppet play scene. 2. Discuss the three flashbacks and their relation to Kaname at present. 3. Discuss the character Louise (i.e. her personality, circumstances, background, relation to Kaname, demands, employment at Ms. Brent’s brothel, etc.). What “type” is she in Tanizaki’s mind? 4. Describe the current situation between Kaname and Misako. 5. Discuss Takanatsu. What he was he up to all along? What does his letter to Misako (182-184) reveal about his intentions? Did he have an ulterior motive all along? 6. Discuss the old man’s strategy with regard to Misako and Kaname? 7. Discuss the theme of nostalgia that runs throughout the work. Describe its many manifestations. 8. Discuss the ambiguous ending. What is O-hisa’s role here? Whose female figure is it that appears in the final passage? How do you think things will turn out? Bonus Questions: Look for additional details that undermine Seidensticker’s interpretation of the novel as a “clash between the new and the old, the imported and the domestic” (Intro, x), as a tug-of-war between the old and new, East and West. (Hint: consider the key passage on p. 152: “In the beginning there was no east and west” (本来無東西).) Also, how does the work challenge/problematize all forms of binary thinking? Describe the numerous binary oppositions that are being questioned/problematized/subverted in the novel. 1. Awaji Island淡路島 (Hyōgo Prefecture): Island at the entrance to the Inland Sea (Setonaikai), forming Osaka Bay. Legend has it that it was the first created by Izanagi and Izanami, the primordial kami. It is separated from the island of Shikoku by the Strait of Naruto. 3. Overidentification: In his book The Plague of Fantasies, Žižek develops the concept of “overidentification,” a psychoanalytic term and potential political strategy by which the malign nature—or “hidden reverse”—of an ideology is exposed through one’s total identification with that ideology. For example, someone who “identifies” with capitalism believes in the possibility of upward social mobility, the “American dream,” etc; someone who “overidentifies” with capitalism—say, Ayn Rand—however, embraces not only the ideology’s talking points but its negative implications as well, namely, the selfishness, greed, alienation, inequality, commodity fetishism, etc. that go along with it. The old man in this novel might be said to “over-identify” with the character type of the 1930s cultural conservative. 4. Fūzoku shōsetsu 風俗小説: “novel of manners”; a novel that takes as its main subject social manners, customs, and mores, rather than the emotions (ninjō) of an individual. 6. A word on the title: Fom the proverb “every worm to his taste; some prefer to eat nettles” (蓼喰う虫も好きずき), meaning “each to his own taste,” “there’s no accounting for taste,” “different strokes for different folks,” etc. “Tade” (蓼) isn’t really “nettles,” but a bitter herb (Polygonaceae), sometimes translated as “knotweed” or “knot-grass,” used as a garnish or sauce with some Japanese dishes, as with the ayu 鮎 in this photo: http://bit.ly/W4F5HF. Answer all of the following. Bullet-point answers are OK. Bring your answers to class, and continue to add to them as you discuss the questions with your group. 1. Identify the focalization points in chapters six through ten. 2. What fūzoku shōsetsu 風俗小説 (novel of manners) elements are evident in chapter six? Is there more “showing” or “telling” in this chapter? What are its main themes? How is this chapter structured and presented like a play? 3. What gift does Kaname receive from Takanatsu? How does Kaname’s interest in this gift reflect his personality/tastes/way of living/philosophy of life? 4. Describe Misako’s personality. Is she really as promiscuous and independent as she makes herself out to be? How do Kaname and Takanatsu perceive her differently? 5. What do we know about Aso’s personality/character? Describe Misako’s relationship with him. 6. Describe the two opposing philosophies of marriage that are represented in the work. 7. Describe the setting (Awaji-jima淡路島) in chapters nine and ten. How are these chapters thematically similar to the “Chijimi chapters” of Kawabata’s Yukiguni (1935)? Explain the significance of this setting in relation to the other sections. 8. Describe the old man’s personality. Consider him in relation to the notion of “overidentification” described above. Also, how is he similar to the narrator of Tanizaki’s essay “In Praise of Shadows” (posted on Moodle)? 9. Describe the old man’s ideas about the west of Japan. How do these ideas contrast with those of Botchan and Kiyo in Sōseki’s Botchan (1906)? 10. Identify passages that reveal a gap between the O-hisa that the old man sees and O-hisa as she actually is. 11. Discuss the significance of the flashback on pages 115-118. How does this early experience inform/influence Kaname’s adult life? Bonus Question: Continue to look for details that undermine Seidensticker’s interpretation of the novel as a “clash between the new and the old, the imported and the domestic” (Intro, x), and as a tug-of-war between the old and new, East and West.